Have you tried quinoa for breakfast yet? 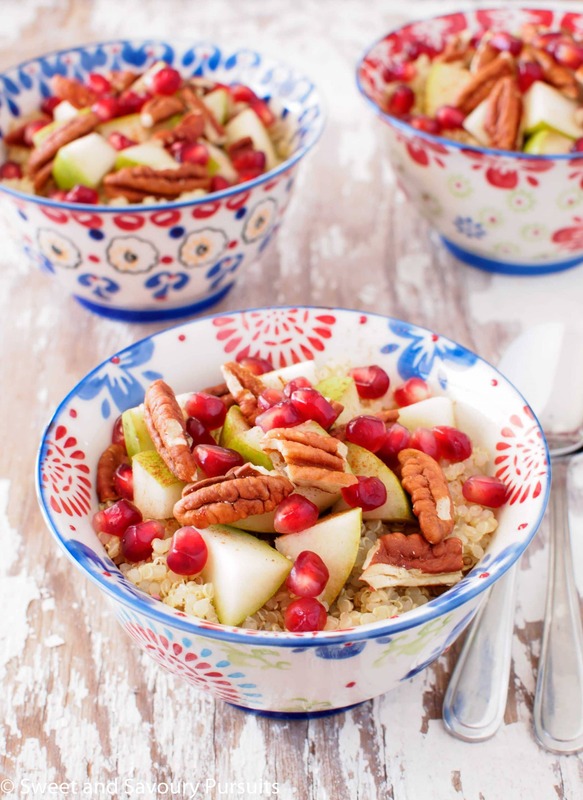 If you’re looking for a delicious, filling and healthy breakfast to start your mornings off right, consider making these incredibly tasty and healthy Pear, Pomegranate and Pecan Quinoa Breakfast Bowls. 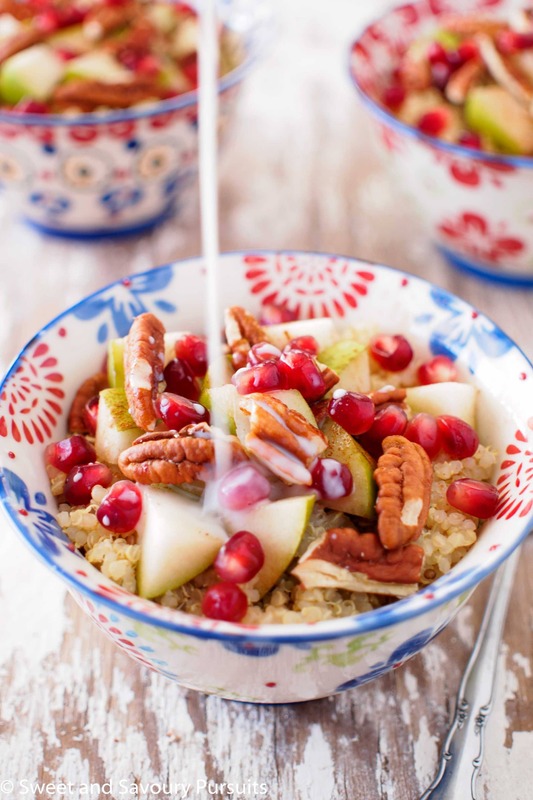 Did you know that quinoa is rather well suited for breakfast? Its naturally nutty and slightly sweet taste makes it a great alternative to the same old bowl of oatmeal, cereal, or granola in the morning. Quinoa is packed with nutrients and is a good source of complete protein. It’s also gluten-free, so this makes it a great option for a gluten-free breakfast. 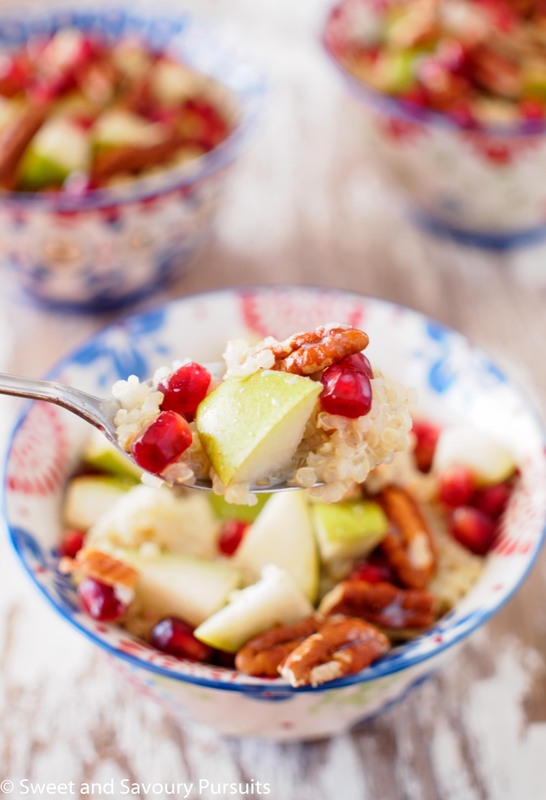 With the addition of pears, pomegranate and pecans, you have a bowl that is also full of antioxidants. If your mornings are too rushed you can always cook the quinoa the night before. In the morning all you have to do is warm it up with your milk and add your fruit toppings. It makes a delicious, warm and comforting breakfast on a cold winter day. One of the best things about this breakfast is how customizable it is, you can use just about any fruit and nut combination you fancy. You can also use the sweetener of your choice and the milk that you prefer. This quinoa bowl has become one of my favourite ways to start my day, but I also love quinoa in this delicious Southwestern Quinoa Salad. 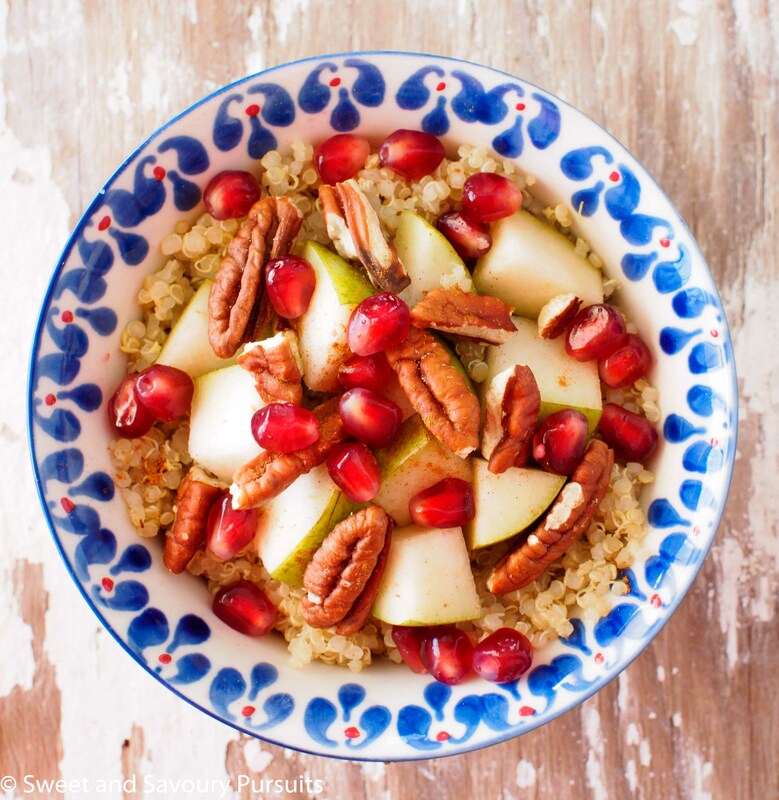 A delicious, filling and healthy breakfast bowl filled with tasty fruit and quinoa. To cook the quinoa, combine 2 cups of water and the quinoa in a medium saucepan. Bring to a boil, reduce the heat to low, cover and simmer for 15 minutes or until water is absorbed, stirring occasionally. When quinoa is cooked, fluff with a fork. Meanwhile, toast the pecans in a 350ºF oven for about 7-10 min, stirring once after 5 min. 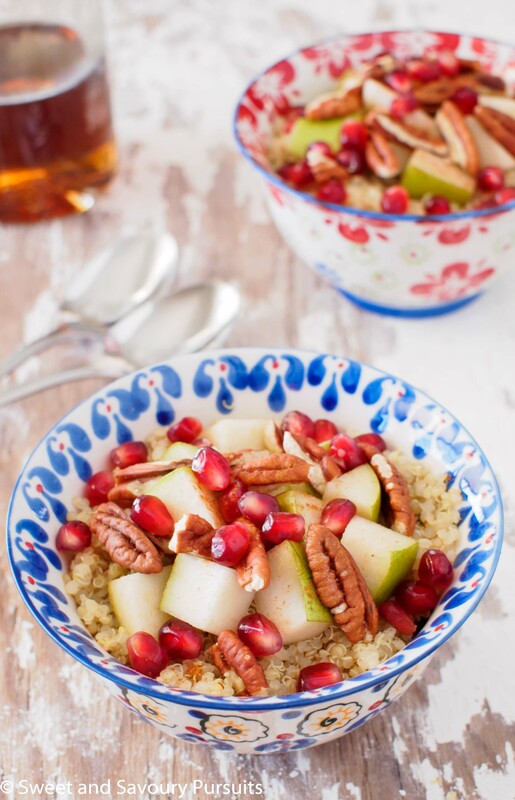 Portion and spoon quinoa into bowls, top each with the diced pear, pomegranate and pecan pieces. Add cinnamon, maple syrup and warmed milk to your liking. Thanks! It’s one if my favourite breakfasts. A bowl full of goodness! Wat a perfect breakfast item! Thanks, it’s one of my favourites for sure. Thanks! What I love about this breakfast is how easy you can customize it and choose the fruit you like. Thank you! Berries, almonds and pistachios sounds like a great combination! Thank you Nancy, it was my first time trying quinoa for breakfast, I just loved it. Wow, so colourful! Who can resist this! I have never considered quinoa to be a breakfast option…so this is a cool idea! Thanks! It was so delicious, I don’t know why I waited so long to try it myself!